Spring is here, so it is time to rotate my bath & body scents to my warm weather rotation! For me, scents are, for the most part, seasonal. In the winter I opt for rich and heavier scents like vanilla, chocolate, and musk and in the Spring and Summer, I like more fruity and light floral scents. So, what are my newest additions to my Spring/Summer body scents? bodycology's Pure White Gardenia and be Delectable (from Cake Beauty)'s Strawberry & Cream! One of my hands-down favorite floral scents is Gardenia. I love the scent so much that I have 4 Gardenia bushes in my yard! So, of course I love the scent in body products, too. 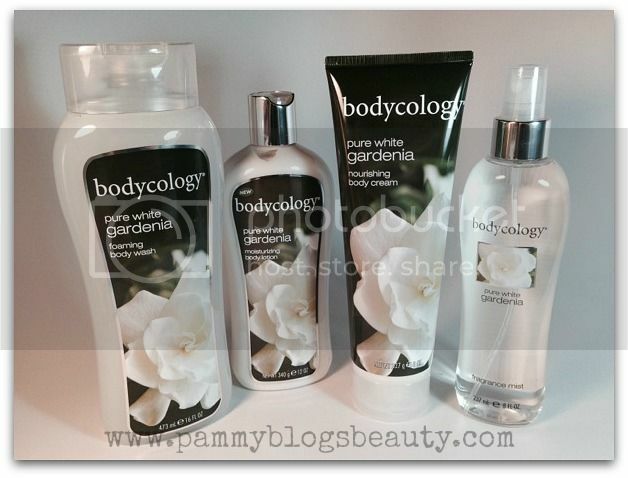 :) bodycology's Pure White Gardenia is a great way to envelope yourself in the lovely scent of Gardenia. Plus, with bodycology's products are just so darn affordable! You can indulge in the scent without splurging. From the Pure White Gardenia line from bodycology, I am using the Nourishing Body Cream, the Fragrance Mist, and the Body Wash. Using these products together is a great way to layer the scent. The Body Wash is nicely foaming and leaves me soft and clean. The formula is conditioning with honey and aloe vera. You can use this in the shower or as a bubble bath. I like putting it on a body pouf in the shower for lots of nice suds. I apply the Nourishing Body Cream after my showers all over my body. The cream contains aloe vera, shea butter, and Vitamins E and C. It leaves me nice and smooth and very moisturized! I finish off my scent layering with the Fragrance mist. I simply mist it all over my body. The formula is very lightly conditioning with aloe vera. I refresh with this body mist throughout the day when I feel like adding more scent. You can find bodycology products at Target, Ulta, and Walgreens. Products are all under $5.00. Who doesn't love that!!! Have you spotted the be Delectable products at Kohl's? This Kohl's-exclusive line from Cake Beauty is certainly worth scoping out! Deliciously blended with the finest Coconut Oil, hydrating Aloe, and rich Shea Butter, be Delectable products quickly absorb into skin without residue, to leave you feeling smooth, soft, and absolutely irresistible. Be Delectable is as good for your skin as for the environment. Up to 95% natural, be Delectable formulas are never tested on animals – and are free of Parabens, Sodium Chloride, Phthalates, Sodium Lauryl Sulfate, GMOs, Mineral Oil, Petrolatum, Gluten and Triclosan. 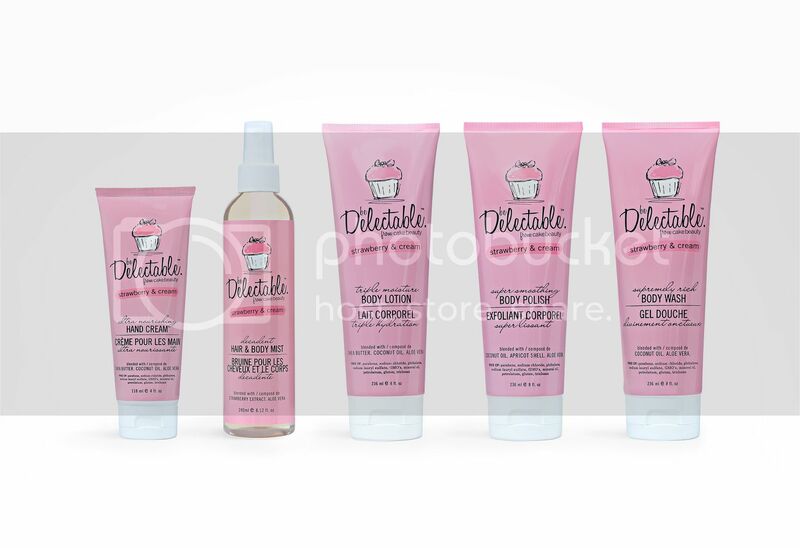 If you are a fan of super-sweet foodie scents, then this be Delectable line of products is just for you. I am currently using and enjoying the Strawbery & Cream scent. I will admit that I am a bit obsessed with Strawberry scents overall. So, I knew that I would like this! I like layering the scents by using the Body Wash in the shower, following up with the body lotion and hand cream, and then finishing with a mist of the Hair & Body Mist. I particularly like that it is formulated for use in the hair! My hair is super long and I always want it smelling good. Sometimes I even spray this in my toddler's hair. 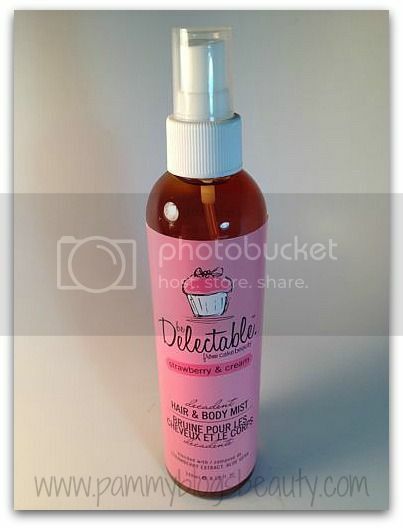 ;) I must try the Hair & Body Mist in be Delectable's other scents! I seriously want to wear hair mist every day! lol I am dying to try all the products in the Coconut & Cream scent, too! Products available: Ultra Nourishing Hand Cream ($10), Decadent Hair & Body Mist ($10), Supremely Rich Body Wash ($10), Super Smoothing Body Polish ($14), Triple Moisture Body Lotion ($12). For gifting, travel, or self-indulgence, try the be Delectable Hair & Body Mist Set ($14), be Delectable Hand Cream Set ($14), or be Delectable Mini-Set Trios ($12).